The discovery of a nest of dinosaur eggs in Mongolia in 1923 provided the first proof that the prehistoric creatures laid eggs rather than giving birth to live young. The discovery of a nest of complete dinosaur eggs in Mongolia in 1923 provided the first proof that the prehistoric creatures hatched out of eggs rather than giving birth to live young. The American explorer who found them, Roy Chapman Andrews, became a legend and many consider him the inspiration for the film hero Indiana Jones. Claire Bowes spoke to his granddaughter, Sara Appelbee. 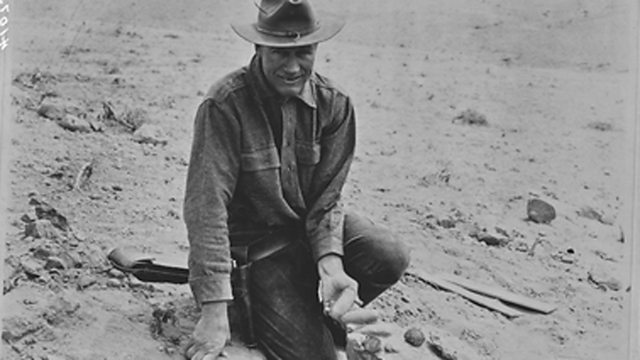 Audio of Roy Chapman Andrews courtesy of Marr Sound Archives, UMKC University Libraries.